Bath Abbey Altarpiece as it was. Altar-piece in hallway. Detail of altar-piece Paving stones from Abbey? I have, in a previous blog, already described the travels forced upon William Hogarth’s massive triptych altar-piece commissioned by the vestry of St Mary Redcliffe Church in Bristol in 1755. After this rather grand parish church decided it no longer wanted its east-end blocked up by 800 square feet of canvas the three separate but linked monster-sized paintings set off to wander around Bristol for 115 years. This rare example of Hogarth’s venture into history painting, in the European grand manner, now languishes at one end of what was St Nicholas Church Museum. Although it is believed there are plans to eventually re-display them (they were first here in the 1950’s) in the Bristol Museum and Art Gallery. But l want to turn to another rather illustrious parish church nearer my present home. The parish church of St Peter and St Paul – more widely known as Bath Abbey – and explain how it is linked with my bumping into an old friend from many years ago. He is a former Bristol businessman who decided to try a fresh career in Cornwall running a hotel. After some years, he and his partner moved back up-country to Bath where sadly my friend’s ‘soul mate’ recently died. They had moved into a villa – built early in the 19th century in the Georgian style and, although small in comparison with its earlier neighbours, a property that has two interesting features. 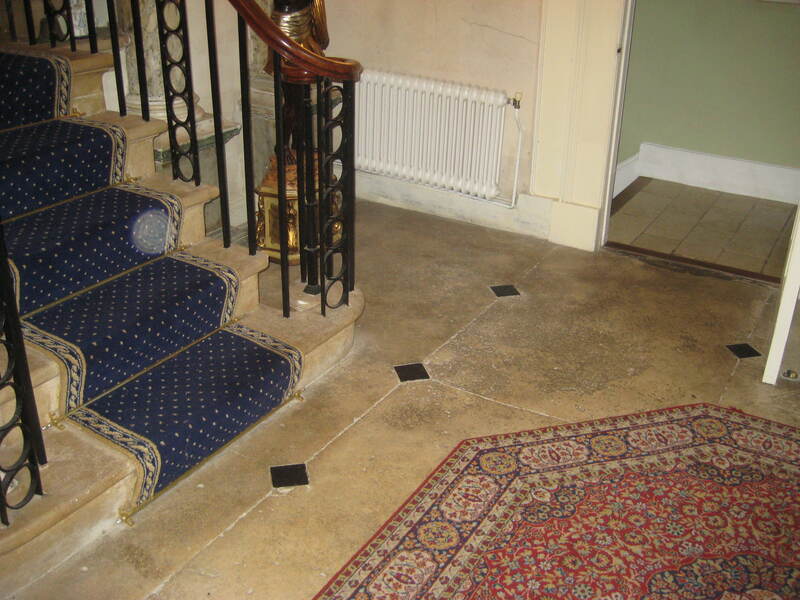 One, apparently rare in Bath, is a central stone staircase rising from the hall, and the other – which is certainly unique – is what has been used to decorate the hall! Let me just explain that this house has been added to one end of a massive Georgian terrace designed by John Eveleigh – a well-known man in Bath both as an architect and designer – and started in 1791 along the London Road. Grosvenor Place was to be a long terrace of forty-one houses and a hotel with a gently convex centre allowing access to Grosvenor Gardens, one of the Vauxhalls or pleasure gardens of Bath. Eveleigh had intended building 143 houses but became bankrupt and had to sell his share in the project. The hotel was never completed as such and the 20 acre pleasure gardens were abandoned soon after 1810. Thirteen years later there was some building work underway and it was probably being supervised by the man who was planning to live in the new house under construction at one the end of Eveleigh’s grand terrace. This man was Thomas Shew – painter collector and art dealer – and, according to Susan Legouix Sloman of Bath’s Victoria Art Gallery, Shew was planning to build a home and art gallery where he could show paintings, sculptures and all manner of decorative objects. The centre-piece to all of this was what took my breath away as my newly re-discovered friend opened his front door to me and ushered me into his hall. 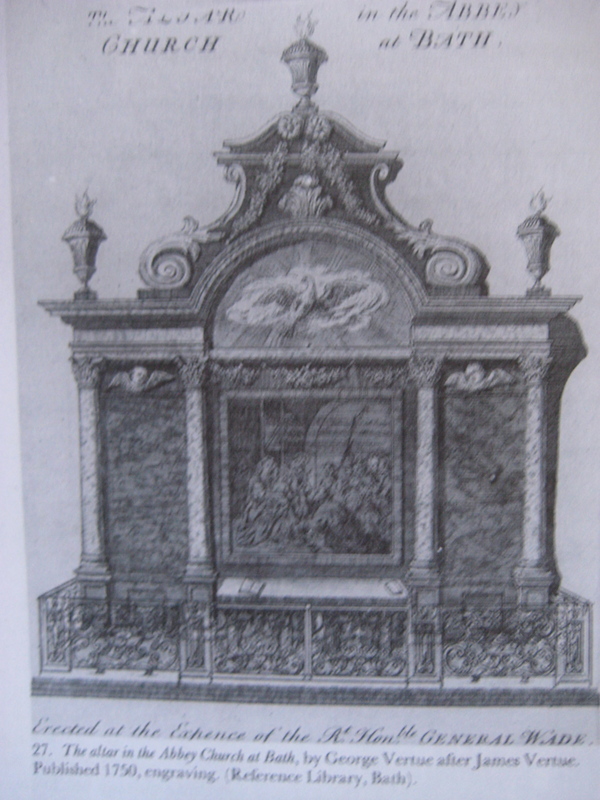 While Shew was building his house – less than a mile away – the Vestry of Bath Abbey were supervising the dismantling of an ornately carved marble altarpiece – originally installed in the church in 1726. The year 1833 marked the start of the first of two major restorations. This one by G.P.Manners. The ornate railings in front of the reredos were sold to William Beckford who used it to make a balcony in front of his house in Lansdown PLace West. The altar painting which had hung between the marble pillars was the first of a considerable number of works painted for Bath by Jan van Diest. It was called The Wise Men’s Offerings and was reported removed to Wells Cathedral but has not been traced. 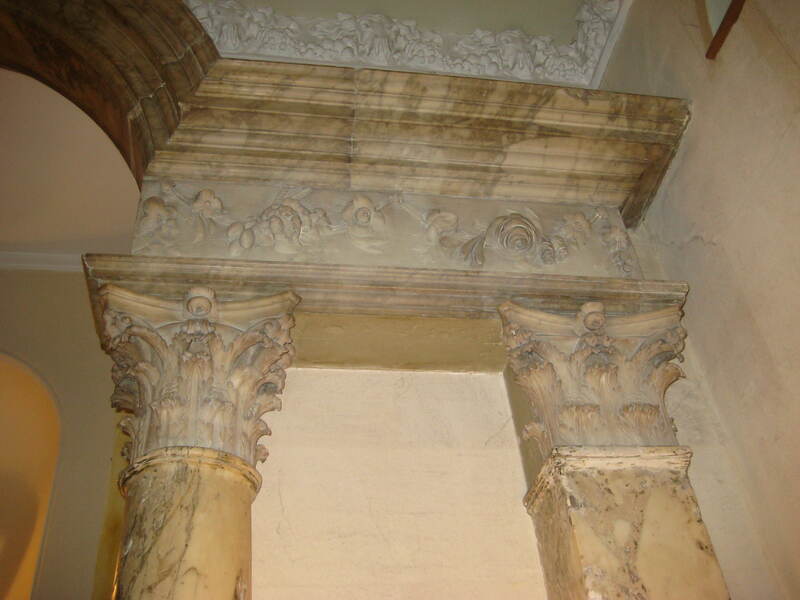 We do know what happened to the marble arch and pillars that made up the altarpiece. Our Mr Shew bought it all and built his new house around it. This was the amazing sight that greeted me as l stepped into an entrance hall apparently also paved with stones from the Abbey Church. The arch, which reaches a height of 170 inches, just fits beneath the ceiling! In England altar-pieces of this date with a painting at the centre are rather uncommon. This one was paid for by General Wade, Member of Parliament for Bath and was built in 1725-26. Reports suggest it cost its benefactor up to £1500 – twice the price St Mary Redcliffe Vestry in Bristol had to pay Hogarth thirty years later. Though, of course, oil and canvas not costing as much as elaborately carved stone. Both altar-pieces – in Bath and Bristol – fell victim to changing tastes. But l found it pretty amazing to find the remains of Bath’s venture into the Romanesque on the other side of a friend’s front door! It was credited to sculptor and mason Samuel Tufnell and made in London. That ornate ironwork is back in the Abbey. Lady Celia Noble – grand-daughter of Isambard Kingdom Brunel – paid for it to be rearranged as a screen across the north transept. A lot of information on the story of Mr Shew’s house and the fate of the Abbey altarpiece come from ‘The Story of a House’ put together by William Henry Gallop – a former Mayor Bath – who lived in the house with his family for many years.